I saw these and I knew right away I needed to make them. They came to me via a facebook post from a friend. She shared them from "High Protein Foods" on facebook. Don't your friends always know just what you need? I must apologize to "High Protein Foods" because I am totally swiping their image but this is the most direct way to show you these wonderful, delectable, totally easy treat. Seriously. I had them made and my kitchen cleaned up in about 15 minutes. I swapped vegetable oil for the coconut oil because I had to have them NOW and I don't have coconut oil. I waited about 20 minutes for them to solidify enough to cut and had one. Amazing! I cut and pasted this from here. Go there. Tell them how wonderful their bars are. Enjoy! 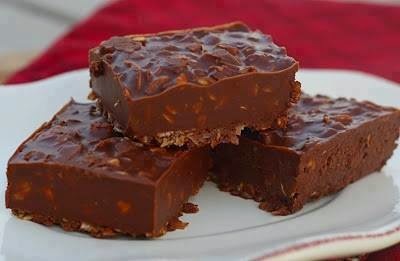 The Best No-Bake Bars You'll Ever Eat! Clean and healthy as always. It's still a dessert so eat in moderation! Melt peanut butter, honey and coconut oil over medium-low heat. Once melted, remove from heat and add oats, shredded coconut, chocolate chips and vanilla. Stir until chocolate is entirely melted. Pour into a 9x13 pan and cool in the fridge. When it's set, cut into bars and enjoy. Store in the fridge. If they last that long!!!! !